Rabbits are a vital part of the diets of several animals, including many carnivorous birds. The size of a rabbit plays a large part in whether or not it will be considered dinner -- for many larger birds of prey, their size is no concern, while for some of the smaller birds of prey, only young rabbits may be a feasible meal. Owls are common throughout the United States, and all are known to capture and rip apart nearly any animal smaller than itself. 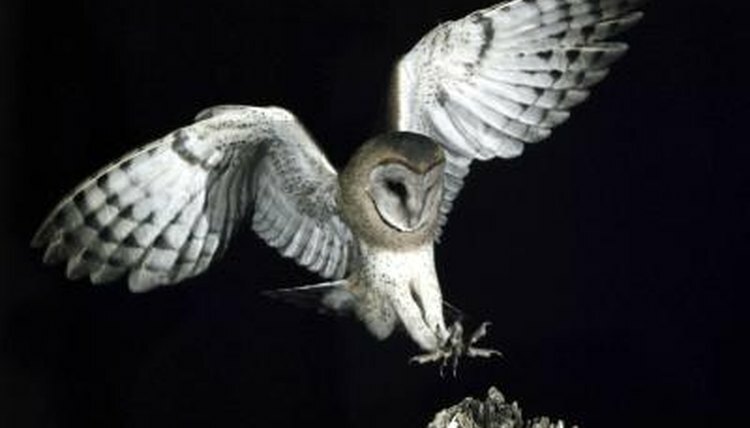 Baby and small rabbits may become prey to nearly any owl, even the small screech owl, while adult rabbits can quickly be overpowered by the large barn owls, barred owls, hawk owls or great horned owls that happen to be hunting in their vicinity. Owls are nocturnal hunters who rely on their superb vision and keen sense of hearing to hunt. Many are sit-and-wait predators, meaning they will perch and wait for prey to come nearby before silently swooping down and grasping the unfortunate rabbit or other animal in their sharp talons. Both the bald eagle and golden eagle are known to capture rabbits from time to time, although bald eagles primarily feed on fish, which makes up 60 to 90 percent of their diet. Bald eagles typically live near bodies of water where they can catch their prey; golden eagles prefer remote areas and may even reach speeds of over 100 miles per hour during flight. Larger hawks are prone to quickly taking down their mammal prey, including rabbits. Harriers are medium to large hawks, reaching lengths of up to 2 feet and with wingspans over 4 feet. These hawks are rather unique among their relatives as they fly low to the ground searching for prey; however, males tend to prey more on other birds while females prefer mammals. Both red-shouldered and red-tailed hawks also feast on rabbits. Both look similar and are closely related; as their names suggest, many red-shouldered hawks have a red patch on each shoulder while red-tailed hawks have red tails. Crows may not be labelled as birds of prey, but they opportunistically feed on small birds, small rodents and other small creatures. In some cases, crows actively hunt their prey. This is where rabbits come into their diet. According to the Virtual Nature Trail at Penn State New Kensington, crows have driven rabbits from fields onto roads where they were subsequently hit by cars and then devoured by the hungry crows.